Find this Platinum 3.02ct Emerald Cut GIA Certified Diamond Engagement Ring at Raymond Lee Jewelers in Boca Raton — Palm Beach County’s destination for engagement rings, men’s wedding bands, wedding bands for women and diamond rings. 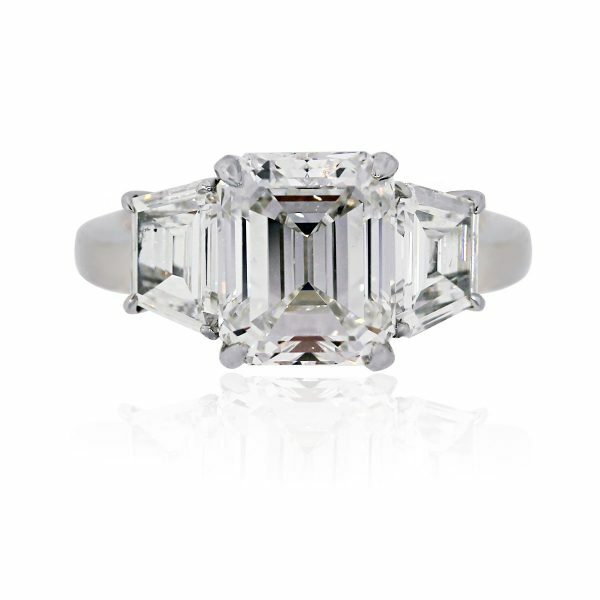 3.02ct Emerald Cut GIA Certified Diamond. Diamond is F in color and VVS2 in Clarity. Approximately 1.50ctw of 2 Trapezoid cut diamonds. Comes with Raymond Lee Jewelers presentation box and GIA certificate! Categories: 3 Stone Engagement Rings, Diamond Engagement Rings, Emerald Cut Engagement Rings | Raymond Lee Jewelers, Engagement & Wedding | Raymond Lee Jewelers. Tags: Certified GIA diamond, Emerald Cut, Engagement Diamond Ring, Engagement Ring, Platinum, Platinum 3.02ct Emerald Cut GIA Certified Diamond Engagement Ring, Platinum Emerald Cut GIA Certified Diamond Engagement Ring, Platinum Ring.